At the weekend we had another break to civilisation, to Wimbledon, where all are busy with life rather than existing as they seem to do down here in Seaford. Another evening in San Lorenzo with Jenny, Annabel and Simon who very kindly drove up specially with my chemo pills that I left behind but had a good dinner as reward. Into 3rd chemo now and the low white blood cell period so need to take care. No more out of date or carelessly reheated food for me. But bowel movements are easier so hoping a CT scan soon will show some reductions in the growths. I’ve never done a retreat before but in the early days of Mark’s illness, Philip visited us and gave us a calmer, wiser perspective on life and death and our place in the world long after we have gone. It made a refreshing change from the clatter of complicated medicine names and chemo procedures. And after the greyest, wettest, windiest winter I can remember, I’m hopefully driving away from the rain clouds into a sunnier climate, fifty miles away. So it’s Yoga Nidra, conversations on spiritual life and exercises from sophrology and Druidry for me and visualisations to calm the mind. Mark had promised that he will keep well as he enters the seventh day after chemo when he becomes more vulnerable to infections due to low blood cell count. His wonderful sister Carole is replacing me and feeding him organic vegetables from her allotment. A headline in The Times today says ‘Sudden weight loss a cancer indicator in the over sixties’.In January Mark lost the weight suggested by the doctor in his health check and I puzzled how he had done it. At the time he said he had cut down on the number of daily meals he was eating, but now we know the real reason. Some of you may wonder what’s going on in exciting Seaford. The beginning of April has seen busy times on Seaford beach. By 3rd April the huge shingle moving trucks have driven away leaving the stones to go back to play and crash about in the constant winds, waves and storms. 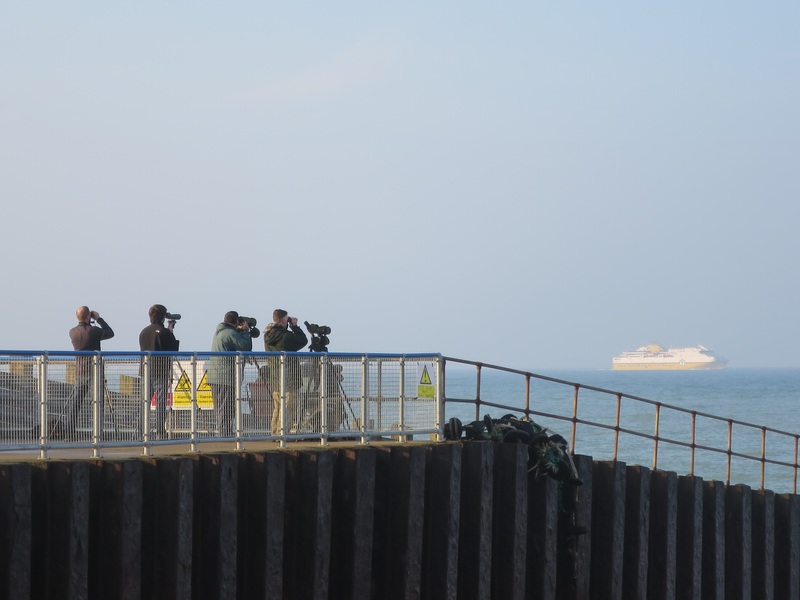 I don’t know whether Splash Point has birders or twitchers who arrive at dawn and sit under umbrellas holding large telescopes and scan the horizon for hours. As a group they are intent on writing tiny pencilled notes on sodden paper notepads and not keen to talk to me. So what birds do they see? 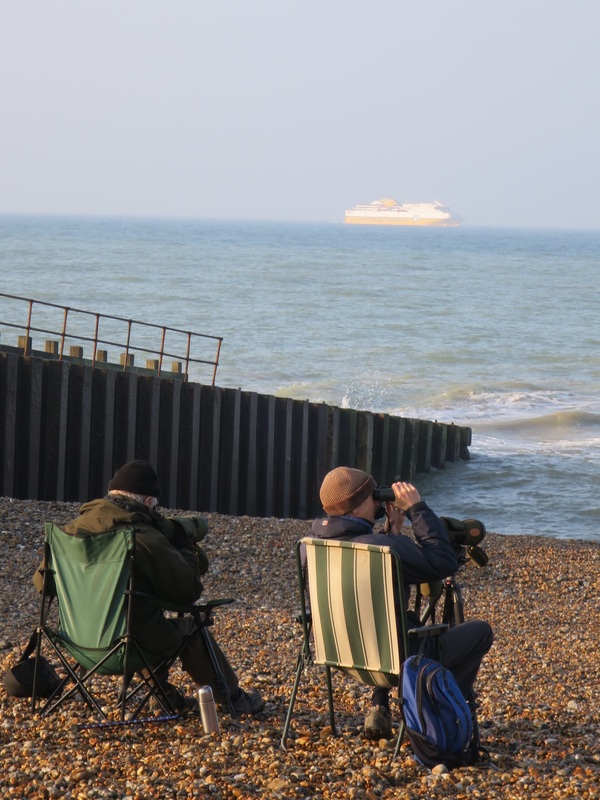 I point out that the great yellow thing in front of their telescopes on the horizon is the Dieppe to Newhaven ferry but the pompoms on their hats sink lower as their heads drop onto their notepads and they hope I’ll go away. Can you see the ferry? My rain spotted glasses mean I can’t see anything but it seems there are plenty of Brent geese, Common Scoters, Red Throated Divers and Sandwich terns flying past. The birds need a wind from the south east which blows them up to the Arctic for their breeding season. I’ve found a blog by Matt Eade who keeps a tally of all the birds he sees each day so maybe I can make a new chum – as long as I don’t speak during birdwatching hours! Can you see the ferry now? Another group of visitors arrive along the Seaford seafront as busloads of students pile out onto the windy coast and shudder in the storms. Clutching clipboards and huddling together they are poorly dressed for their cliff climb and the horizontal rain which gets under the tightest tied hoodie. Sometimes poorly prepared teachers take their groups up the cliffs and let them perch on the chalk cliff edge, presumably unaware of the massive cliff falls during the autumn of 2017. ‘Where have you come from?’ I occasionally ask. ‘Oh very far away.’ ‘Where’s that then?’ ‘London’ is the usual reply. It seems this Geography GCSE day trip is to investigate ‘How coastal processes create distinctive landscapes and the role of human interactions in altering this.’ They look at how to prevent Seaford from flooding and the impact of erosion of the chalk cliffs. Our address will be Cliff Closer soon instead of Cliff Close.